Learning about what a particular college will cost is a Top Task for high school students and their parents. And yet most college and university admissions sites don’t give special priority to letting people complete that task quickly and easily. From a marketing perspective, that might have been OK 10 years ago. Today it is not. 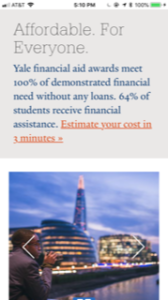 Yale University is different from most undergraduate admissions pages: The message and link you can’t miss as the page opens is bold and bright: “Affordable. For Everyone. Estimate your cost in 3 minutes.” Yes, 3 minutes. How can it be that fast? Follow that link and you don’t arrive at the typical cumbersome FAFSA-like financial aid estimator. Yale is one of 46 private sector schools that use the MyInTuition format that requires less than 10 data points to provide a cost estimate. Why more schools have not adopted this approach is a mystery. Is this content priority right for everyone? Yes, if “cost” is a question often received by admissions counselors at college fairs. No, if your research shows that cost is not a factor early in the recruitment cycle for your potential students. No, if you know that most people who find and visit the required financial aid estimator page complete the page and receive an estimate. But any private sector school (and more than a few publics) with tuition discounts that substantially lower the sticker price likely will benefit from doing something similar to the Yale effort. Just adopting MyInTuition doesn’t guarantee that people will quickly find it. At Babson College, for instance, you won’t see it mentioned anywhere on the undergrad admissions page. Follow the link to “Tuition and Financial Aid” and you’ll see it listed just after “Use Babson’s Net Price Calculator.” Content priority and potential impact are not quite the same. Harvard says completing the MyInTuition form will take 5 minutes. Whatever the time, more schools need to seek competitive advantage by provide a personalized cost estimate that’s easy to complete… and high visible to potential students and their parents. Learning about likely cost is a priority at Yale. Being fast in the mobile world is not. Google Test My Site gives the undergraduate admissions page a “Poor” 13 second mobile download time, with an estimated visitor loss of 31 percent. To see how a private sector university gives bold and bright content priority to learning about likely costs right from the start of the college search, visit the Yale University undergrad admissions page. Join 651 people on the Top Tasks: Higher Education Website Content group on LinkedIn.